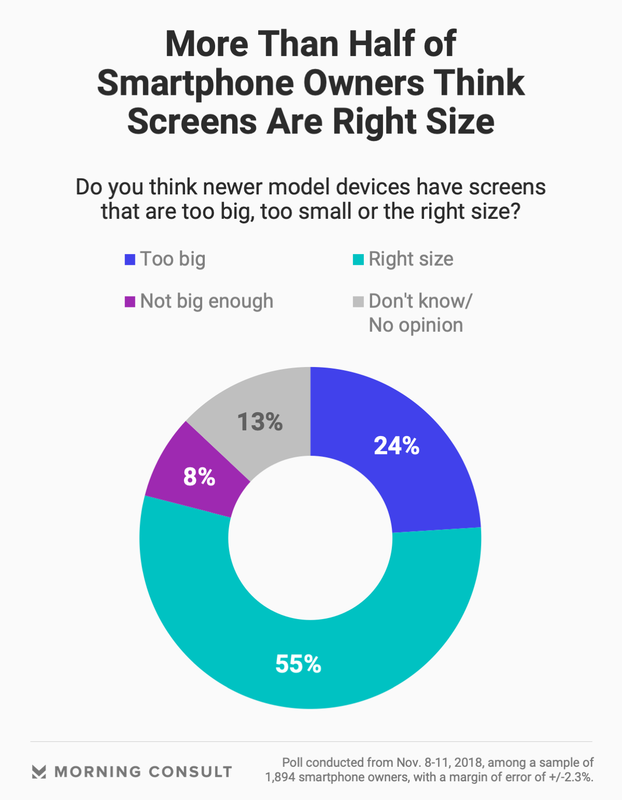 55% of owners say newer smartphones’ screens are the right size; 24% say it’s too big. 31% say they spend most of their phone time for texting; 17% say updating social media. While smartphone makers such as Apple Inc., Samsung Electronics Co. and LG Electronics Inc. continue to dress up devices with high-tech options such as facial recognition, voice assistance or virtual reality, smartphone owners say they value functional features when picking a phone, a new Morning Consult poll suggests. When asked what they considered important factors when deciding what phone to buy, battery life (95 percent), ease of use (93 percent), memory storage size (90 percent) and durability (88 percent) topped the list of priorities for consumers in a Nov. 8-11 poll that surveyed 1,894 smartphone owners. More advanced technological features such as augmented and virtual reality tools (30 percent), parental controls (32 percent), facial recognition capabilities (33 percent) and digital wellness tools to track phone usage (37 percent) sat at the bottom of the list of important factors among consumers. The survey asked two samples of about 1,000 smartphone owners each about various purchasing factors; the samples have a margin of error of 3.2 percentage points. Although consumers seem to prioritize practical phone features, phone manufacturers still focus their marketing efforts and fall product events on the more high-tech, possibly superfluous designs — such as Apple’s decision to include facial recognition to open an iPhone or Samsung’s plans to make its devices foldable. In the poll, 41 percent of smartphone owners said they would be likely to buy a foldable smartphone. A lot of that marketing could be the result of high market saturation: The recent poll shows that 86 percent of adults say they own a smartphone already. A plurality of smartphone owners (39 percent) said they own an Apple iPhone, 30 percent have a Samsung device and 14 percent have a device from LG, while other smartphone manufacturers such as Google and Motorola netted a total of 14 percent. 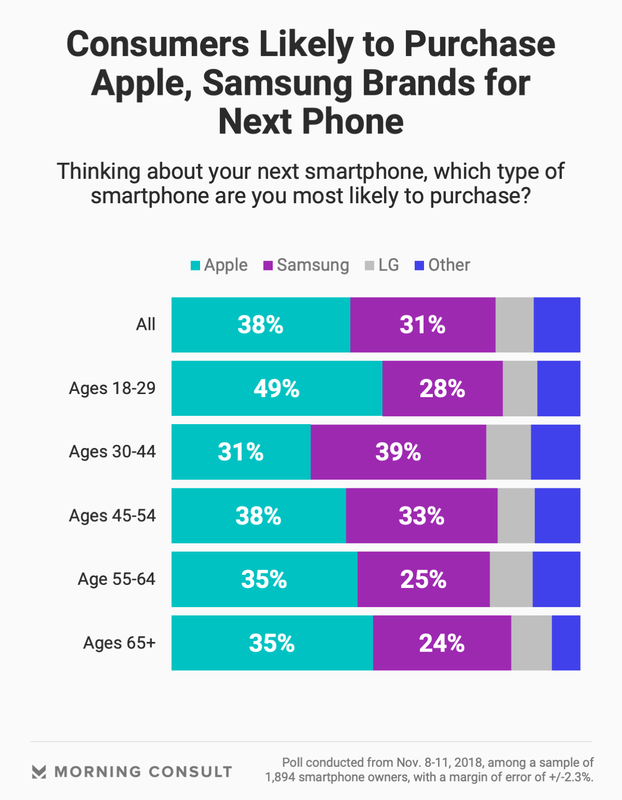 When thinking about their next smartphone purchase, 38 percent said they are most likely to purchase an Apple device, 31 percent said Samsung and 8 percent said LG. The poll of smartphone owners has a margin of error of 2.3 percentage points. The industry is forced to innovate its marketing approaches to keep sales and revenues growing, said Ben Arnold, senior director of innovation and trends at the Consumer Technology Association. Apple, for example, has seen iPhone sales plateau in recent years — but the company has increased prices for the device, cushioning the impact on revenue numbers. In its fiscal fourth quarter report, released Nov.1, the company missed analysts’ expectation of 48.4 million iPhone sales, selling 46.9 million unit in the three-month period, according to Bloomberg data. To excite consumers, manufacturers have to focus their marketing on the high-tech features that differentiate devices from one another, like facial recognition and other artificial intelligence tools, Arnold said. 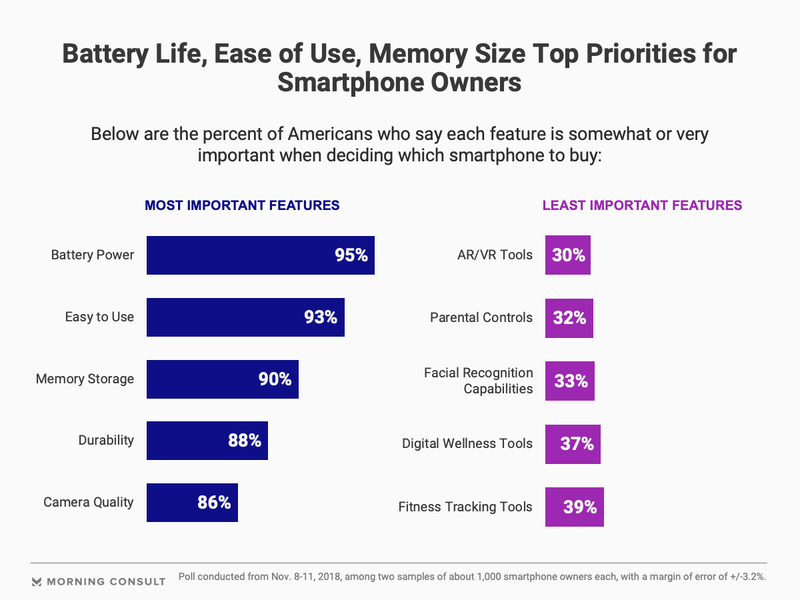 But that doesn’t change the fact that consumers have baseline needs before purchasing a phone, Arnold said, which is why they tend to care more about practical features like battery life, durability and memory storage. Consumers are also mostly using their smartphones for what they have been designed to do for years, with a 31-percent plurality saying they spend most of their phone time responding to text messages, 17 percent saying they mostly use their phones to update social media and 13 percent making phone calls. For adults ages 18-29, 26 percent spend the most time texting and 23 percent updating social media. Ten percent of adults overall spend most of their phone time watching video content, 2 percent said they use it for GPS navigation or ride-hailing apps, and 1 percent said they spend most of their time taking photos or videos. Rob Wengel, executive vice president of client development and head of innovation practice at WPP PLC-owned research group Kantar, said that both Apple and Samsung focus a lot on customer-driven design, which allows them to concentrate on creating features that consumers want early on and often, helping them achieve market dominance. In the case of Apple, he said it makes sense that a lot of the tools the company highlights seem superfluous in today’s market, given the company’s design approach. “What Apple does really well is that they not only look at what the consumer needs, but they’re really looking at the latent needs that customers have, and they’re just getting way ahead of it in how they design products,” he said. Apple and Samsung did not respond to requests for comment. Sixty-five percent of smartphone owners appear to see value in most of the tools on their devices already, while 23 percent said the majority of tools on their smartphone are not of practical use to them and 12 percent said they do not understand most of the tools on their smartphone. Amid phone manufacturers’ efforts to continue increasing the size of their devices,with Apple’s latest iPhone, the XS Max, boasting a 6.5-inch display screen (a full inch bigger than the 2016 iPhone 7 Plus’ 5.5-inch screen size) 55 percent of all smartphone owners said newer models have a phone screen that is the right size, while 24 percent said it was too big. But brand loyalty might be the top purchasing consideration for a lot of consumers, Arnold said, seeing as most have used a certain operating system for years. In the survey, 68 percent of smartphone owners said they were more likely to purchase a certain phone model if it were from the same manufacturer as another tech product they already possess, such as a tablet or laptop.